This week's giveaway is sponsored by It Works! with Alexis. It Works is an incredible health and wellness company founded in 2001. After just 7 years, the company became debt free and was featured as one of the fastest growing companies in Inc. magazine and is now taking the world by storm! Alexis is eager to work side by side with you to help you find the perfect It Works solution for your busy life. How to enter: We all have a vegetable nemesis (*cough* mushrooms *cough*), so let's call them out here! Simply leave a comment here and tell us about that one vegetable that you or a family member simply cannot be convinced to eat. For a BONUS entry, share this giveaway on Facebook or Twitter (don't forget to tag us) and comment again below to let us know. Please don't forget to leave an email address, if I cannot contact you then you cannot collect your prize! Facebook entries can no longer be accepted. Contest ends at 10:00PM on Tuesday, October 09, 2012. Winners will be announced Wednesday, October 10, 2012. Entries open to the US only. Congrats, Gloria! You have WON Greens by It Works! with Alexis, a $40 value. Greens is a drink powder that offers 8+ servings of fruits and veggies in just TWO scoops! The product is packed with 38 superfoods that are great for the entire family. Check out It Works! with Alexis to see many of their products, ranging from their most popular It Works Body Wrap to supplements and skincare. I love them, but raw carrots make my daughter gag! 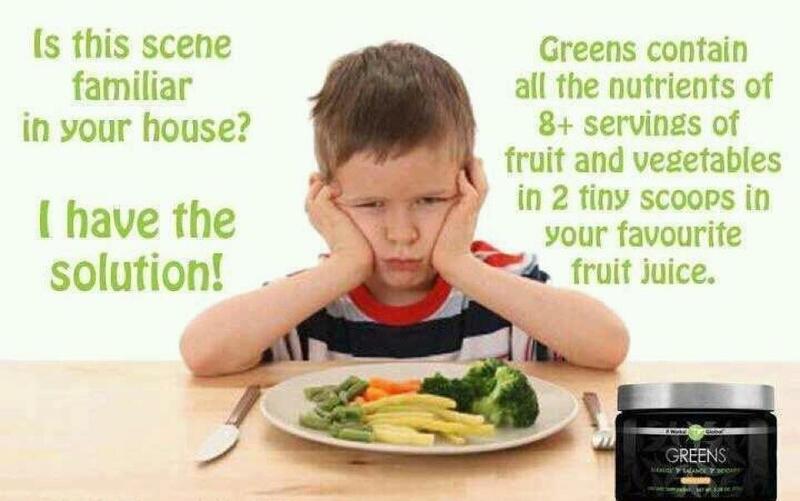 It is impossible to get my 12 year old son to eat any fruits or vegetables. He has severe sensory problems and gags. I have looked for any way possible to try to get him to eat fruits and veggies, with no luck. Would love to try this.